Rain is very important to the Morro Bay estuary and the lands that surround it. Every drop of rain that falls within the Morro Bay watershed can make its way into the bay through creeks and storm drains. Rain helps plants grown on land. Rain is also important for plants and wildlife that live in the water. It ensures that fish can survive the dry season and balances out the salt in the estuary. Rain can also be destructive. When too much falls at once, it can lead to erosion and wash sediment into the bay, making it difficult for plants and wildlife to thrive. Recording rainfall helps us understand what we can expect to see happening in the bay. Join your neighbors to monitor rainfall in the Morro Bay watershed! Install your rain gauge in an open area away from overhangs, gutters, and runoff. Whenever it rains, make a note of how much rain collects in your gauge. It is best to do this once per day. Watch your new data pop up in the Rain Gauge Network table below. North Morro Bay—Choose this section if you are in Morro Bay, north of the intersection of Highway 1 and Main St. This area drains to Estero Bay, outside of the Morro Bay estuary. Morro Bay—Choose this section if you are located in Morro Bay, south of the intersection of Highway 1 and Main St. This area drains directly into the Morro Bay estuary. 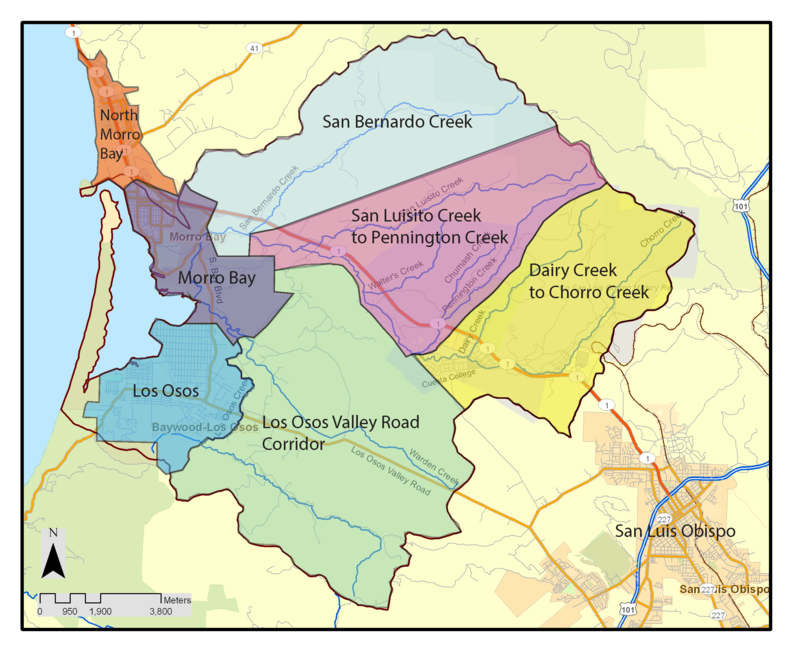 Los Osos—Choose this section if you are located in Los Osos. This area drains directly into the Morro Bay estuary. San Bernardo Creek—Choose this section if you are located closer to San Bernardo Creek than you are to downtown Morro Bay. San Luisito Creek to Pennington Creek—Choose this section if you are located near San Luisito Creek, Walter’s Creek, Chumash, Creek, or Pennington Creek. Dairy Creek to Chorro Creek—Choose this section if you are located near Dairy Creek or Chorro Creek. Los Osos Valley Road Corridor—Choose this section if you are located south of Highway 1 and outside of Morro Bay, Los Osos, and San Luis Obispo. San Luis Obispo—Choose this section if you are located in San Luis Obispo.